Controversy is growing over the CRL Rights Commission’s claim that some major Christian organisations and groups support their recommendation to license (and thereby control) religion in South Africa. 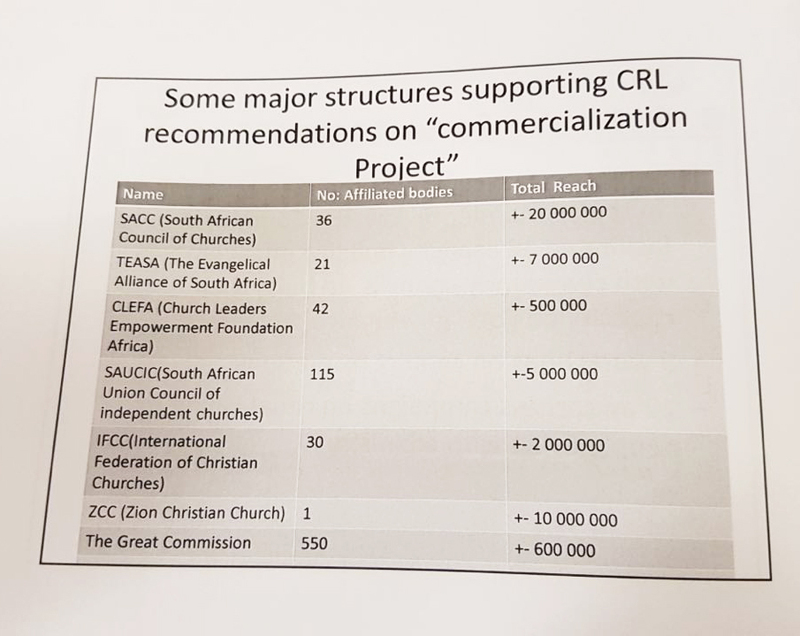 This claim was made in the CRL’s official Annual Report presented to Parliament last week, and in which they stated that the South African Council of Churches (SACC) and The Evangelical Alliance of South Africa (TEASA) are among “the structures supporting the CRL recommendations on Commercialisation project” (see image). Stephen Brislin, Archbishop of Cape Town and President of the Southern Africa Catholic Bishops’ Conference (SACBC) is on record as saying that “a recommendation that new laws be introduced to enforce registration of pastors and ministers is overkill and a response that one would expect more from a totalitarian state than a constitutional democracy”. Nevertheless, since the CRL’s Annual Report has already been tabled and presented to Parliament, the statement contained in their Annual Report will be taken as the official position of these organisations unless/until they make a further statement to clarify their position. 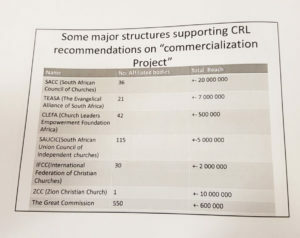 Since further hearings into the CRL’s “Commercialisation of religion” Report are taking place before the COGTA Parliamentary Portfolio Committee on Tuesday 18th and Wednesday 19th October, FOR SA believes that it is important that these organisations do provide clarification on their positions before these hearings take place or at the hearings themselves.